This is for you if you know you thrive in groups, are free on Wednesdays, and want a lower price point but still willing to work for what you want. Small group coaching to move your life and projects forward. To define or rediscover your life's purpose. Identify your fears, automatic stops and your comfort zone. Understand how overwhelm works and how to get out of it. Discover what's possible for you and your life. Map out your future and learn the steps to get where you want to go. Make decisions faster and with more clarity. Choose outside of fear and scarcity. Ceate the life, work, relationships, love, and money you really want. This workshop is for individuals who are interested in learning tools and techniques to re-jumpstart their big goals for this year. You also get a FREE 1:1 coaching session with the workshop. Overview of how professional coaching works. To rediscover your life's purpose. Create a plan for the next year. Ready? Take advantage of the early bird pricing and register via PayPal today. Not ready to talk? Ok, keep reading. All that good sounding stuff. We all know WHAT makes for good communication, but most of us don't know HOW to create it wherever and whenever we want. We talk about being "nimble" and "collaboration" and "authenticity" but most of the time feel unsupported in a meeting or thrown under the bus during a presentation. Big Time changes all that. With our training, you'll learn how to be poised and unflappable in front of any audience. Whether it’s taking the podium at a conference or meeting one-on-one with a colleague or client. The ability to communicate clearly and effectively is essential at every level, from your front-line staff to the CEO. 1-1 training is also available. 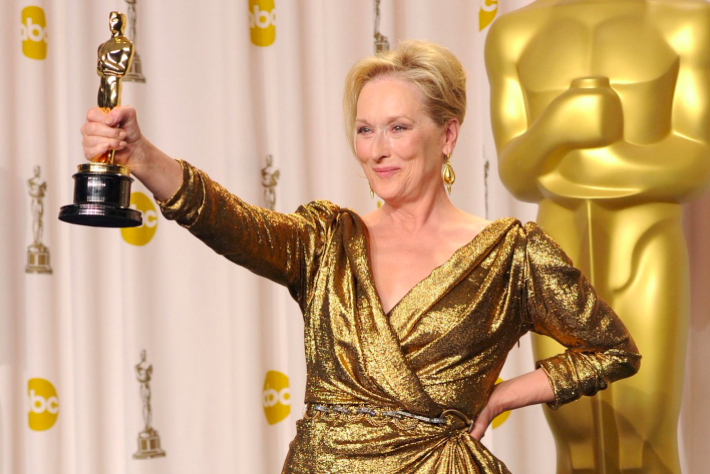 Don't you want to feel a little more like this Meryl? ​What's the matter? Still not convinced? ​You've probably been avoiding this class for years. In this interactive talk, your team will learn about the benefits of applying improvisational skills in the workplace—from decreasing stress and increasing productivity, to improving customer service and strengthening relationships. Improv holds the key to unlocking fixed mindsets, building trust, fostering teamwork, and helping your people go from good to great. Get ready to laugh and play as your team gets pulled up on stage to illustrate what makes teams go from good to great. This is like a team-building workshop, but with more butts in seats. Are you as memorable in meetings as you are online? When people meet you, do you exceed their expectations and make a lasting impression? A story is the single most effective way to capture your audience’s attention, connect with them, and explain business concepts. Taren will teach you how to tell stories that transform your listeners, your work performance, and your bottom line. Perfect for work retreats and off-sites where you want your staff to be educated and entertained. If you found out that you had only six months to live, what would you do next? Quit your job? Tell that special person you love them? Why isn't your answer, "Exactly what I'm doing right now”? In this moving and unforgettable keynote, Taren tells the story of the first six months she spent working with in hospice care, and what that experience taught her about how to making life and work meaningful, every day. "Taren has the ability to bring people out of their shells and interact with others in ways that surprised us. People are still raving about her workshop so I would consider it a big success!" Big Time offers personalized coaching tailored to your organization’s specific needs. Big Time helps professionals become dynamic, confident communicators in virtually any speaking environment--formal presentations, group discussions, job interviews, TED talks, conferences, wedding toasts and business meetings. Whatever the challenge, Taren customizes her training and coaching based on her client's learning style and the kind of speaking practiced in both personal and professional settings. All classes are held in a fun, low-pressure, non-threatening yet highly challenging environment, and Taren challenges each student with levity, sensitivity and at the appropriate individual gradient. Average class size is 5-8 students, with each individual allotted loads of time to practice and support outside of class. The emphasis is authentic connection and communication, not performance. Session One - Assessment and Whatchowant? Getting to know you, what you do, who you are and what you want to create from here. Then the class is designed around your individual need. Session Two - Individual challenges based on week two. Taren designs these for each student based on week one's intake. We might work on your volume, movement, voice, content, presence, or something else. Whatever your challenge is, that's what we'll address in session two. Session Three - We'll implement the skills learned in sessions one and two through storytelling. Based on your homework from session two, we will tell stories and learn best practices of storytelling. What makes a good story? How to start, tell and finish a great story. We'll work with "going blank", self -consciousness and other destabilizing blocks to telling great stories. Secret: everything is a story. Session Four - Integration and new challenges. Based off the first four weeks, Taren creates new challenges for each student based on their ground taken in class so far that are aligned with their overall goals for the course. Session Five - Impromptu and/or prepared speech. Learn the secret of outlining and presenting a prepared speech with minimal effort or stress. Outline and deliver a speech unassisted. What!? Crazy!? I know. But, it's what you came for, so let's not act surprised. Then… Graduation. "Taren's classes and coaching have completely changed the way I approach my speaking engagements and presentations. She has helped me get out of my own way by teaching me how to suspend my own agenda and truly connect with the audience that's right in front of me." Both in group settings and individual coaching, Taren's coaching unlocked talents and skills in our team members, resulting in natural and effective communication. We continue to feel the impact within our organization, and facing our constituents. Public Speaking: It's not about you, it's about them. Pitches that win: From White Board to Webby's! Conference Calls: It's not what you say, it's what they hear. Effective Interviews: Q & A the Right Way. Funnier Meetings: Because no one wants to do business with boring. a six-week program based on those needs. Email Taren to get started. Leadership Coaching can help you create the life you want. I've become a coach because all the successes I've had in life have been due to the clarity, connection and support I've received from various coaches over the last 10 years. I can easily say that all of the big changes I've been able to accomplish were conceived and acted on with the support, feedback and accountability of a coach. When you work with a coach, you take responsibility for your life. As your coach, my job is to help you see where your fears, defenses and other blocks get in the way of you achieving what you want. No matter where you're at in your career or on the organizational chart, you become a leader of your own life. I hold open the doors of possibility. It's up to you to walk through. If you know you want more, if you know there is a bigger, better version of you waiting in the wings ... perhaps it's time to step into the light and start the show. Email me to schedule a free call to find out what's possible for you. BIG TIME prepares individuals and businesses for the spotlight. be more effective & ﻿perform with confidence﻿.